The sea of containers atop the freighter ship. 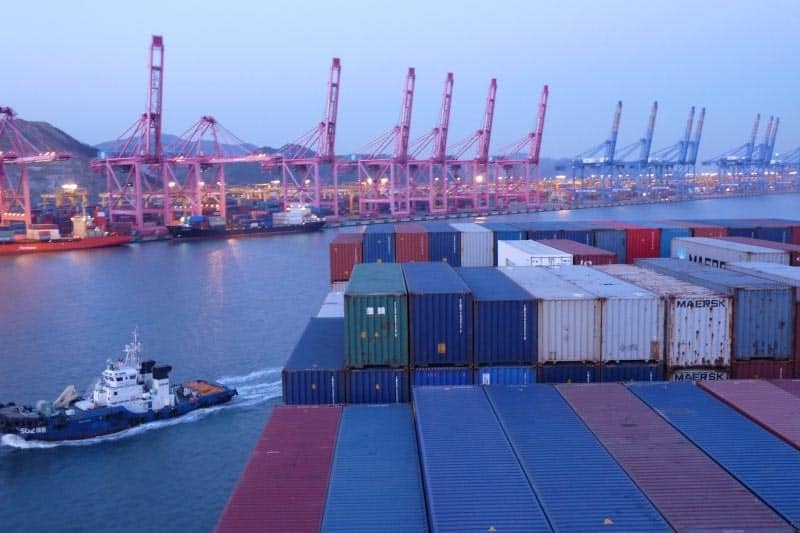 The ship docked in Busan at 11 am and departed at 6 pm, just long enough to load and unload containers. 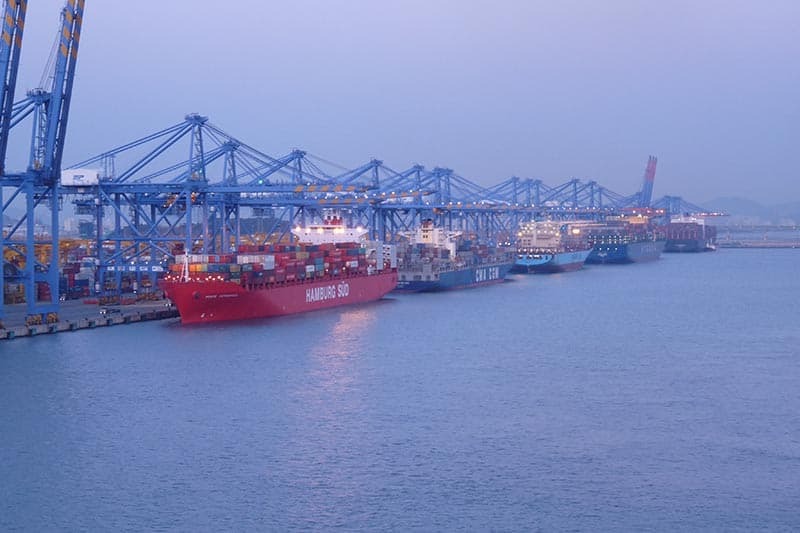 Busan New Port Terminal, a new and vast container terminal, is forty kilometers to the west of the South Korean city of Busan. I pass through the formalities of passport and security easily and I’m driven past endless stacks of multi-colored containers and giant yellow cranes. Seven huge freight ships sit at the quayside while enormous blue cranes grab and deposit containers from the backs of trucks onto to their decks. My adventure travel by freighter had begun. Halfway along, through the windscreen, I spot the big blue ship that will be my home for the next twelve days as I cross the Pacific Ocean from here to Seattle. Next to the cranes and the stacks of containers, the vessel does not seem too big, until I get out of the car and look up at it from the bottom of the gangway. Alone, I apprehensively carry my bags up the steep and rickety stairs, holding tightly to the rope handrail with my free hand. 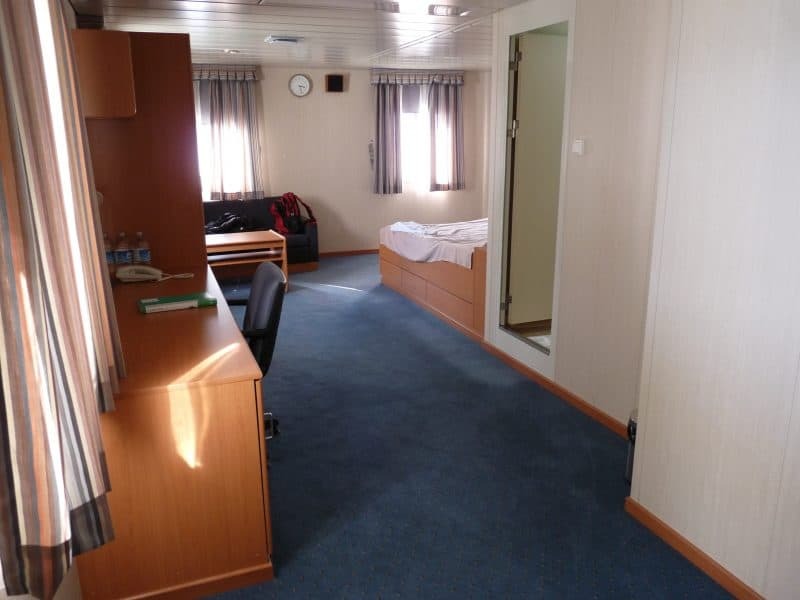 The freighter has four very spacious cabins for its few passengers during the long journey. On board, I’m immediately a curiosity. I meet the Chief Officer (also known as the Ship’s Mate). In English, but with a deep French accent, he welcomes me on board. I shake his hand and feel embarrassed that my hand is oily from the staircase, even though he is in overalls and clearly working. The Steward, a Filipino, takes me to my cabin, as the busy loading and unloading continue during the few short hours the ship is in port. 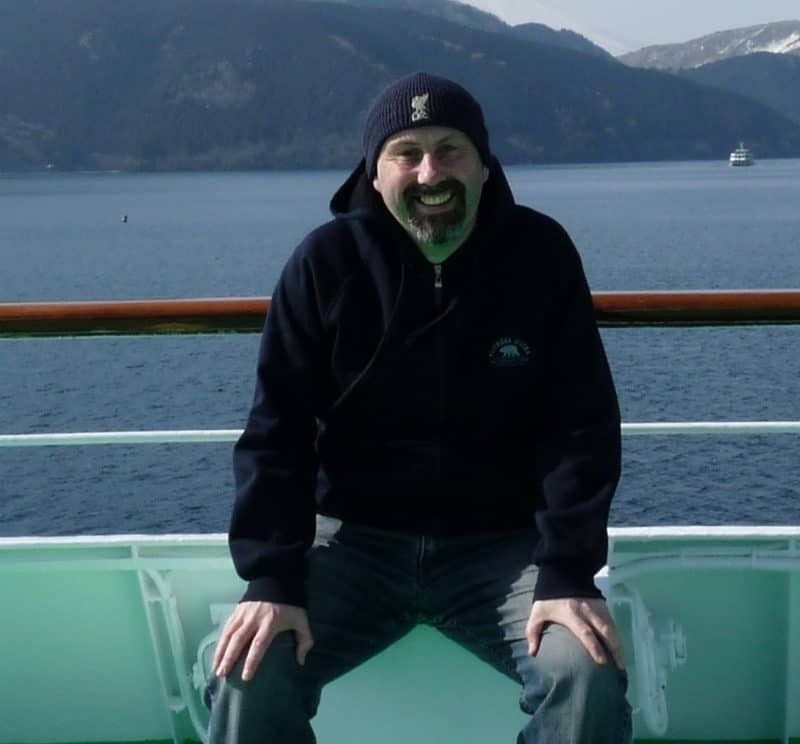 The Steward has been on the ship for three months with no break and has signed up for a nine-month voyage. I follow him, quite lost, trying to understand where I’m going, as well as listen to what he’s saying. Travel by freighter, here is my big blue home for many many weeks. He shows me the important rooms - where to eat and where to sleep. There are four cabins on my deck, the Passenger Deck, but I will be the only passenger on this stretch. My cabin surprises me. It’s spacious with a desk, sofa and side table, wardrobe, double bed, and a bathroom. I have four windows; two to the starboard side, currently a view of the waterside of the harbor, and two to the rear with a view of the containers already loaded and the port beyond. Wow, I’m impressed already. Next to my cabin is a door to the outer deck and the Steward shows me how to open it. He says I’m free to wander anywhere but to stay away from the loading areas and to be aware it’s a busy time in port. I unlock the hefty door opening and wander out. 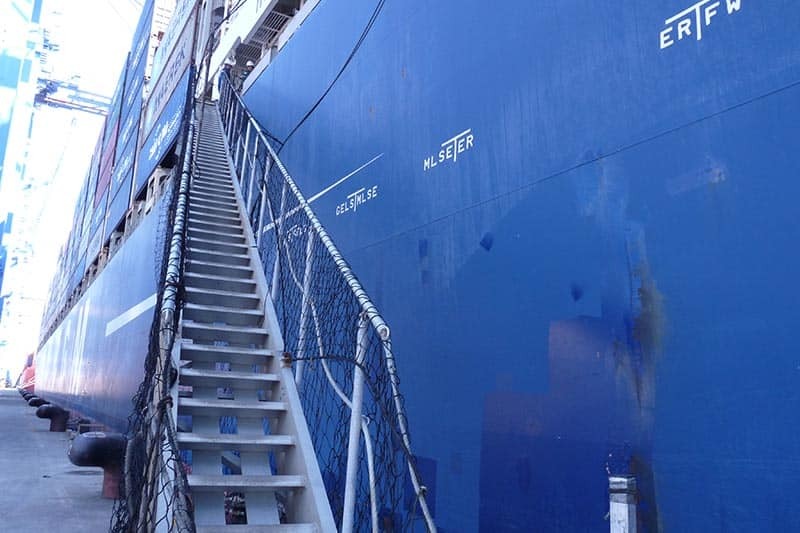 Excited rather than afraid, I climb the steel staircases all the way to the top of the vessel; to the wings of the navigation bridge. Starboard and behind, the bay shimmers in the sunshine. The mountains and the cityscape of Busan with its many bridges are off in the far distance. There are many small islands out in the bay that the ship will have to navigate around and there is an exhilarating glimpse of the wide blue ocean beyond the harbor gates. Travel on freighter: As the sun sets, the ship begins its 30-minute turn-around with tugs and then heads out into the Pacific. Port side, containers are being lifted on board with absurd speed and ease by three giant blue cranes that tower over the ship. Beyond is the quayside that I was driven along earlier and it looks tiny from up here on the Bridge. The trucks and containers are small dots below. One by one, the containers are picked up effortlessly and then loom large as they are deposited in stacks on deck. To the front and back, either side of where I stand, the ship is laden with multi-colored, rectangular containers. I feel elated already and we haven’t even left port. My cabin is fantastic. I am alone. There are no other passengers. The sun is shining and I have the whole of the Pacific Ocean to cross. Back in my cabin, I read the Familiarisation Manual. The vessel was built in July 2010 and is under the French flag. It has a dead weight of 109,020 tons and is 334 meters long with an average speed of 24 knots. With perfect timing, just as I have unpacked my things, the Chief Officer phones my room and tells me that the Cadet is available to give me a tour of the vessel and to meet him in the Ship’s Office on Upper Deck. Not having sea-legs, I do not realize that the Upper Deck is not actually the upper deck. Up the staircase from the Passenger Deck, I find the Officer’s Deck and the Captain’s Office. He warmly introduces himself to me. The young Captain is short and slightly overweight and very jovial. He sends me down to the Upper Deck to meet the Cadet. The top deck is the Navigation Bridge with the outside wings I had walked on earlier. From here, the Cadet and I watch the final containers being loaded. The Cadet tells me that the Captain and crew do not get to know what is inside any of the containers unless they are classed as dangerous goods. 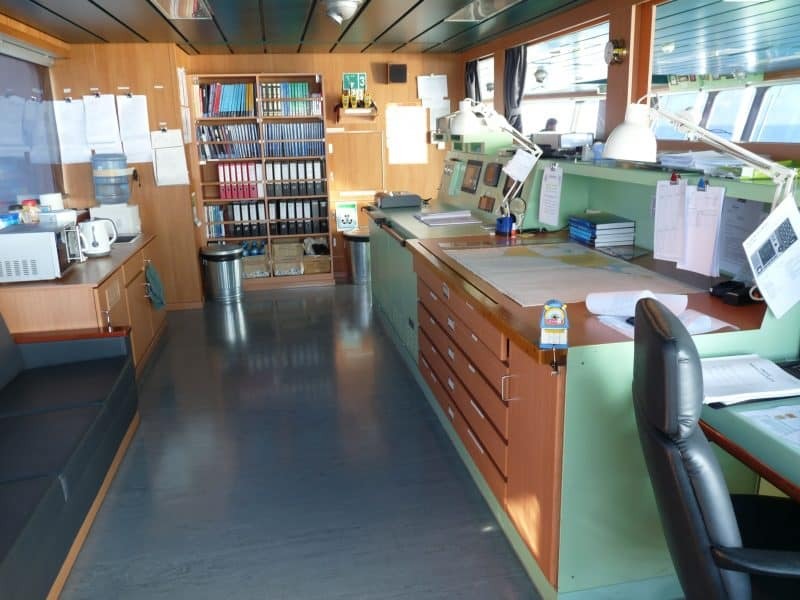 Inside, the Bridge has the various consoles, controls and other electronic equipment for the operation of the vessel. The Upper Deck, where the pilot helps navigate the way out of the harbor. To the starboard side is the Navigation Office with the maps and charts for our journey. I am fascinated by the maps and the Cadet shows me the route we will take. 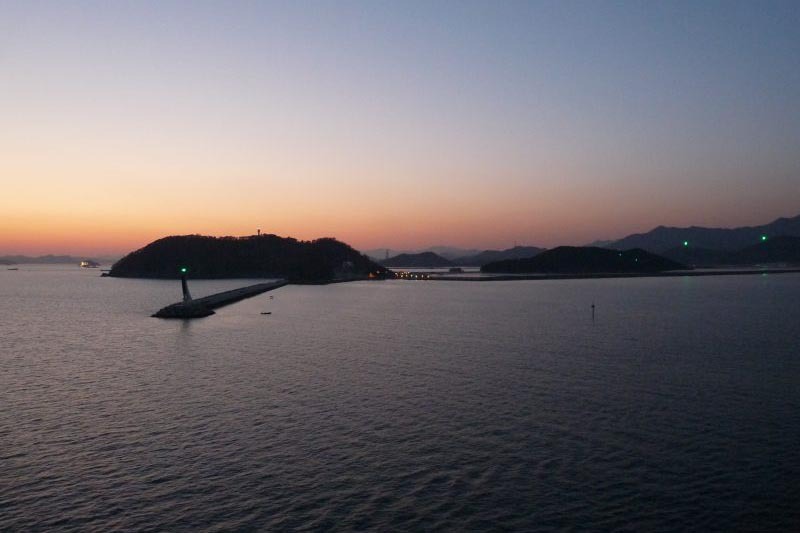 Leaving Busan, we will head north and sail between the main islands of Japan, Honshu, and Hokkaido, through the Tsugaru Straits, and into the North Pacific Ocean. The route has already been charted and he says that I can come to the Bridge whenever I want to investigate our route, where we have been and where we will go. The Cadet has only been a seaman for a short time. He joined this ship in Savannah, on the east coast of the US, and has traveled across the Atlantic, through the Suez Canal, to Hong Kong, Yokohama and now Busan. When I speak about my travels I usually get an amazed reaction, but with these guys, I’m a novice. Thirty minutes later, the Cadet prepares the Bridge for our departure. I am allowed to watch from here too. To add to my delight, we will depart at six o’clock, right at the beginning of sunset. 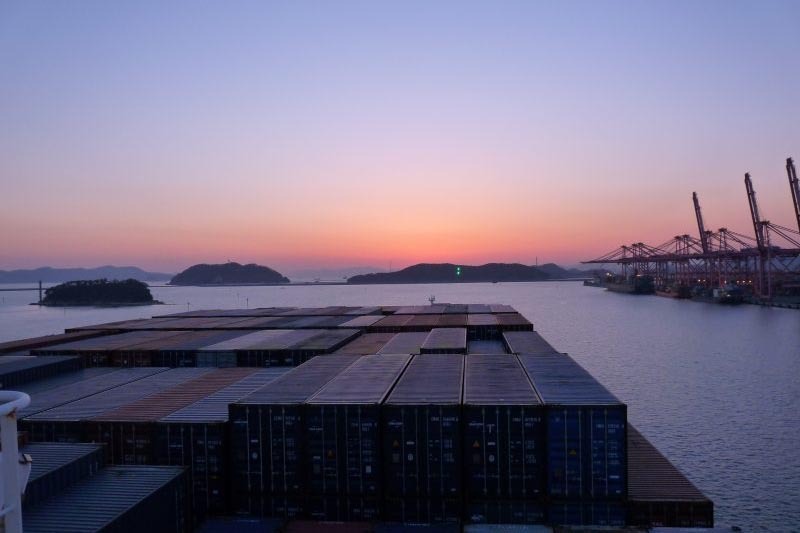 The ship only arrived here in Busan at eleven o’clock this morning and so the stop in port has only been seven hours in duration, with little time for shore leave. Very slowly, the ship moves. The Captain and Pilot control the departure from the port side wing controls. Two tugs help to pull the vessel out from the quay and to turn the vessel. 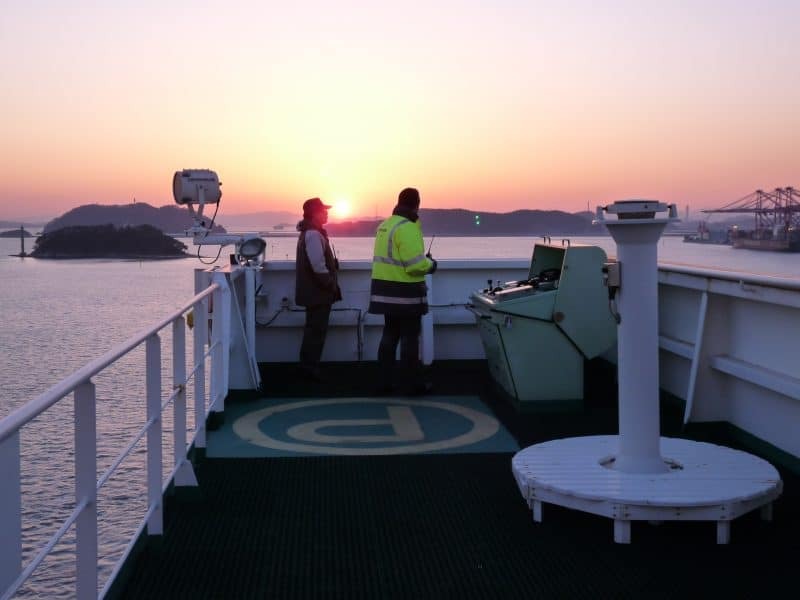 A few of the crew, including the Chief Engineer, arrive at the Bridge to watch the spectacular departure into the bright red sunset. As the sunlight begins to fade, the lights of the harbor illuminate the cranes and the vessels that remain. The sky has turned now to a deep red and it shimmers on the ocean in front of us and the harbor lights reflect in the sheen of the colored containers. The ship's route from Busan to Seattle Washington. I watch from the Bridge still, as the Captain and Pilot are now bathed in the last rays of the day out on the wing. It takes over thirty minutes to turn the vessel before we slowly maneuver out of the port. The Pilot, now that his work has been completed, departs back to port in one of the tugs. The ship ventures slowly toward the harbor gates. I notice the signs on the harbor walls. On one gate it says, ‘Pusan New Port’ and on the other, it says, ‘See you again’. I can’t help but think they have lost an opportunity for a pun; maybe, ‘Sea you again!’ Passing under one of the gigantic white bridges of Busan with the city lit in the darkness, we begin our fabulous adventure across the Pacific Ocean. I arrive at dinner in the Officer’s Mess a little late due to the incredible sunset departure but, with typical French time-keeping, only the Filipinos are at dinner before me. I have almost finished by the time the French officers arrive. There seems to be a collective joy that they are at sea again. In my spacious cabin, I feel so emotional. I think about how worried I was about this part of the trip back in Seoul. I thought that leaving Vladivostok in the ice on the Eastern Dream was spectacular, but this has really been something special. I am the only passenger on a container ship traveling across the Pacific Ocean. Life does not get better than this. Writer. Traveler. Coach. 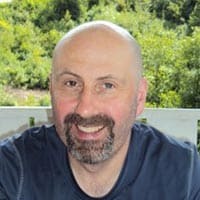 Pete Martin is an author of transformational journeys. His recent book is called “Revolutions: Wandering and wondering on a Sabbatical Year”. For anyone stuck in a rut, this is a compelling tale to deal with change and to follow your dreams. More information is available at www.petemartin.org where Chapter One of the book is available for free.